Testing your gold, silver and platinum is as easy as dropping by your closest Canada Gold location for a free, no-obligation evaluation and quote. We follow a (surprisingly) quick and simple seven step process to quickly and accurately test, weigh and value your items. The great news is it’s all free of charge and no appointment is necessary! If you would rather do some of the testing on your own, then read on, some of these tests can be done yourself. As you arrive at one of our locations, you will be greeted in a friendly manner by one of our buyers. There is typically little or no wait. The first thing we do is sort out items that are not gold or silver. To do this we use a very strong rare earth magnet. This is not a refrigerator magnet, but an incredibly powerful permanent magnet made from alloys of rare earth elements. The reason we use this is because gold and silver are not magnetic. This helps us quickly sort out items that are not solid gold or silver. However, there are many non-valuable metals that are also non-magnetic, so this is not the only test you will see us do. The second step in sorting involves checking for stamps. Many stamps are visible to the naked eye but some are stamped on the tiny posts of earrings or are too worn down to make out. In this case we use a jewellers loupe which gives 20x magnification. Stamps tell you what the item was sold as and is a fairly reliable way of identifying the gold purity. However, it is not unusual to find an item stamped as one purity that is not even gold, or actually contains less gold than it should.. We will group the stamped items into grids on our desk and those that are unstamped will be placed to the side. If visual and scratch testing methods do not confirm clear results, your items can be tested with an X-ray fluorescence scan. The machine used for this test is a state-of-the-art device capable of providing detailed analysis by measuring the intensity of the X-rays that are reflected off your item, this is called wavelength dispersion analysis. When testing is complete, a full report indicates the percentages of gold content as well as other alloying metals such as copper, silver, zinc, etc. This method is the most accurate way to determine the composition and purity of different metals, and can be performed at our Vancouver, Surrey and Toronto offices. There are several steps and processes used to determine the value of gold and its purity. Some of the most common and industry standard processes as well as the most advanced methods are used by Canada Gold to determine the value and purity of your items. Some testing is fairly simple and can be done in the comforts of your own home, while others use acids and complex equipment, and can only be done at our offices. We’ve taken the time to briefly outline and describe some of the steps taken to test gold and silver. Rub the piece of jewelry or the item across a piece of unglazed porcelain tile. It should not leave a black streak across the porcelain. If it does then the piece is pyrite. If the streak is golden yellow, then it is usually gold. 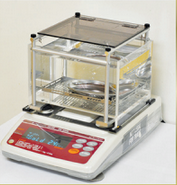 A Moh’s scale can be used to determine the hardness of the metal in the jewelery or item. Gold has a hardness of approximately 2.5 to 3 on the Moh’s scale. Glass on the other hand has a hardness of 5.5. Acid testing is a common practice when testing gold. Place a small drop of hydrochloric or sulfuric acid on the item. If the gold begins to dissolve, then there is some other type of metal mixed with the gold. Always be careful and use protective safety equipment when testing with acids, make sure to read the product’s warning and safety labels. Having the ability to test the purity is crucial for anyone involved in buying or selling gold or silver. A jewelry item that is stamped 10k, 14k or 18k does not necessarily mean it contains that type of gold. Fakes do exist in the gold market. With the price of gold hitting all time highs, greed and dishonesty can be evident in the industry. For this reason, always be careful when purchasing gold, make sure to always purchase gold from a reputable company. Occasionally a lower quality of gold may be stamped with a higher grade marking, or other times it may not be gold at all, but rather layered with gold in such a way that it is not immediately apparent that it is plated. It’s important to test your items to protect yourself and your investment from forgeries and some of the unscrupulous buyers and dealers that are out in the marketplace. At Canada Gold, our testing is done in full view, explained and verified to each and every client and customer. A drop of appropriate acid is placed on a discrete section of the silver item. If the spot shows a creamy colour, it is 90 to 100% silver. A gray colour indicates 77-90% silver and a light green colour means the item is 65 to 75% silver. If you have any questions about testing before you send in your items or stopping by one of our locations, please feel free to contact us. We rub the item on a smooth black acid testing stone. Next to item’s mark, items that are confirmed to be 10k, 12, 14, are scratched as well. A small drop of acid is placed on the stone along the scratch marks. If the item is the same karat or higher, the colour of the scratch mark for the item will appear the same as the mark from the confirmed piece. 18K acid can be applied to the scratch on the stone. Any gold that is less than 18K will disappear in less than 30 seconds. Gold that remains on the stone is 18K or higher. Once all the items have been sorted by karat, we begin weighing the items on a scale. The scale is calibrated and certified by Measurement Canada. Our scale will show you the true weight of your items in grams. Typically we weigh all items identified at a particular karat together but can also weigh individual items for you. If items have stones or inserts we will subtract the weight of those stones. Gems the size of 1 carat diamonds will weigh approximately 0.2 grams. We assess the rough size and number of stones in the items and subtract this from the weight of your item. For example, if a piece has 4 small stones of the 1/10th carat size we will subtract 4 times 1/10th of 0.2 grams (ie. 0.08 grams). If your diamonds or gemstones are large enough to have significant resale value (typically diamonds larger than 0.25 carats), we will pay for these stones as well! Please click here to read about our diamond buying services. Our prices are based on the current market price of gold and silver. Please reference “What is My Gold Worth” for more detail as to how these prices are set. You will find that your payout offered by Canada Gold is among the highest in the industry, and if you find one higher, we will beat it by 50% of the difference! (terms and conditions can be found in the “How It Works” section of this website. Your payout is based on the purity (karat) and the weight of your items. We will provide our offer and you can select which items you would like to sell. There is no commitment on your part. Some large items may not be solid gold or silver. These items are tricky as they can be thickly plated, filled with weights or something of the like. A final test before payment may be required by the buyer to confirm the item is authentic. This can involve cutting the piece and damaging it beyond repair. We will ask for your permission before these types of tests. Essentially we will agree to pay the quoted price if the item is authentic. If you do not wish to have the test performed on your item, we will be happy to return it to you, but will not be able to purchase the item. Once you are satisfied with our payout, the buyer will, if possible, remove any stones that you have requested back. On the open market small used stones have little to no value but you may be able to use them in the design of future jewelry. Once stones and inserts have been removed, the items are re-weighed to confirm the quote and the offer is adjusted accordingly. There is no cost added for the testing or estimates as you may find elsewhere, and you will be paid on the spot without any hidden fees. To make things safer for us and for you, we have moved to a cheque-only business. Our cheques can be deposited directly into your account. Should you prefer to have the cash right away, our branch of the Royal Bank of Canada is located two blocks from our office at Broadway and Cambie and they can cash cheques under $3000 (there is a $5 fee if you are not an RBC customer). This service is also available at any other branch of the Royal Bank of Canada. We want to thank you for your interest in Calgary Gold and hope we have helped clarify what to expect when you choose to deal with our company. If you have the time, we encourage you to shop around. We expect you to find us to be the most honest and upfront gold buyer with the highest payouts for your gold and silver – guaranteed. Should you have any further questions, don’t hesitate to contact us.